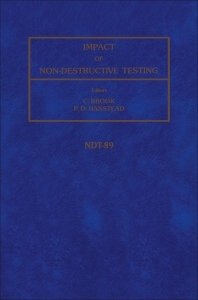 The 28th British Conference on NDT, the annual conference of The British Institute of Non-Destructive Testing, was held in Sheffield, UK, 18-21 September 1989. Its theme was the impact of NDT, and it provided a valuable opportunity for participants to learn of the current developments in the field. The formal presentations are recorded in this volume; all of the major methods of NDT are detailed, with an emphasis on ultrasonics. Other topics covered in papers include radiography, electronic imaging, crack depth measurement, concrete, and NDT in aircraft. The papers combine to present a comprehensive account of the latest literature in the field, with an excellent representation of the conference's research sessions. Overall the book serves as a valuable record of the conference and provides an insight into recent literary contributions for non-attendees. For materials scientists and mechanical engineers concerned with non-destructive testing and its impact. Section headings and selected papers: Ultrasonics. The role of ultrasonic diffraction in NDT, M G Silk. Inspection of adhesive joints using ultrasonic spectroscopy, P Cawley. Ultrasonic velocity in API 5L grade X 60 steel, A C Duncomb & A Okell. High resolution C-scan assessment of diffusion bond condition in SPF/DB impact test specimen, A K Dunhill & C T Ross. Radiography. A review of digital radiological methods, R Halmshaw. Fully automated X-ray inspection of automobile wheels, W Roye. General Papers. Electronic imaging - the future, D G Rothery. NDT in aerospace - the next decade (1990s), R G Taylor. In-service NDT on modern aircraft composites, T A Price. Aircraft condition monitoring - current and future methods, P Chivers. The condition monitoring of power press blanking tools using surface acoustic waves (SAWs) and acoustic emission (AE), M J Bathe et al. Condition monitoring through oil analysis on British Rail, I J McEwen. An investigation of the use of coils of different orientations for austenitic vessel inspection using eddy currents, R Clark & L J Bond. Crack depth measurement using an advanced ACPD technique on a large tubular joint, J R Rudlin & R Kare. An introduction to the non-destructive testing of wire ropes, C H H Corden. Recent work at the national NDT centre on concrete inspection, C G Tasker et al. NDT in the quality control of fasteners, H G Beech. NDT technolgy transfer from research to industry, F M Burdekin. Qualification for NDT instructors, S J Lavender & R A Hamlett. Author index. Subject index.